Down to Earth evidence that reveals Jesus' purpose and what that means for you today. Know Jesus as more than just a good teacher and inspiring leader; know Jesus as the point and purpose of your life. Want to know more of who Jesus is? 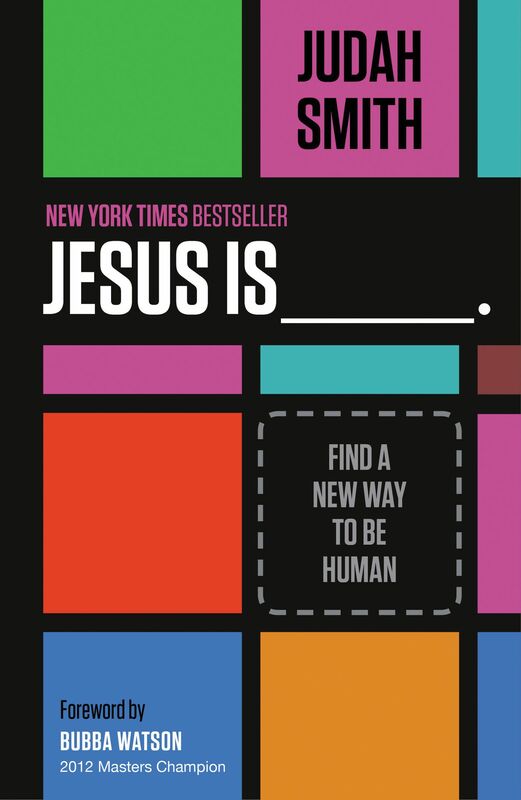 In ‘Jesus Is …’ Judah Smith offers a fresh an engaging review of the question and the answers for new believers, seasoned Christians and the ‘just looking. Just about everyone has an opinion of who Jesus is and - just maybe everyone has glimpse of the truth from their own particular circumstances and perspective. Jesus is a lot of things, but the real and complete answer that makes sense of the sentence, ‘Jesus is…’, is in the Bible. That’s where you’ll find the whole truth from the one perspective that really counts; that’s where it says that Jesus is the Son of God, who came to earth on a mission to restore mankind to God. By living a perfect life, dying on a cross, and coming back to life, Jesus' mission was a success. Now we can know God because we can know Jesus. The the reality of who Jesus is seems way too large for the blank - butmaybe that's because we haven't given Jesus the space to be who he really is... yet. • John Ortberg's 'Who Is This Man' and Max Lucado's 'Grace'. • Short, easy to read chapters in a conversational style. • Memorable lines and phrases that enlighten and encourage. In his book ‘Jesus Is...’,Judah Smith explores the down to earth evidence that reveals Jesus' purpose, what he accomplished and what it means for us his followers today. After reading Judah Smith’s book, you’ll know Jesus as more than a good teacher or even an inspiring leader; you’ll know Jesus as the point and purpose of all life. Judah Smith and his wife, Chelsea, are the lead pastors of the City Church in Seattle, Washington. Prior to assuming the lead pastorate in 2009, Judah led Generation Church, the youth ministry of The City Church, for ten years. 'Today' magazine rated Generation Church as one if the top five “most dynamic” youth groups in the country, under Judah’s leadership. As well asr winning recognition by 'Outreach' for its pastor having the most contemporary hair, City Church also received recognition of being one of the fastest growing churches in the country. City Church now has four satellites orbiting the Seattle metropolitan area. Well-known as a speaker at conferences and churches around the world, Judah's humorous yet poignant messages demystify the Bible and show people who Jesus is in their everyday life. Judah is in high demand as speaker, both in the US and abroad. He’s spoken in conferences such as Phenomania, the Hillsong Conference, Catalyst and more. He has authored several books and is a popular voice on Twitter. The couple have 3 children: Zion, Eliott, and Grace. Judah is an avid golfer and all-around sports fan. This book 'Jesus Is -' is supported by A DVD based 8 session study kit. 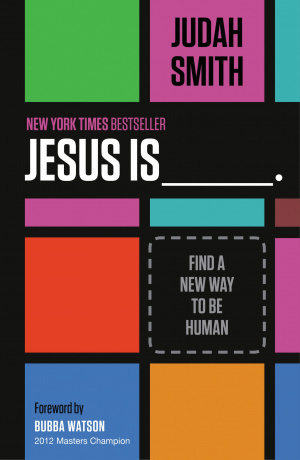 Jesus is by Judah Smith was published by Thomas Nelson in February 2013 and is our 14256th best seller. The ISBN for Jesus is is 9781400204755. Be the first to review Jesus is! Take a peek at some articles related to Jesus is. Got a question? No problem! Just click here to ask us about Jesus is. In these pages, Judah Smith fills out that sentence again and again, each time further revealing the character of Jesus. He writes as if to a friend, illustrating the importance of Christ's message to modern men and women. This is a book for new believers, for lifelong followers, and for the merely curious. Judah Smith shows us the Jesus that somber paintings and hymns fail to capture. With passion, humor, and conviction, he shows that Jesus is life. Jesus is grace. Jesus is your friend. Jesus is a new and better way to be human. Judah Smith and his wife, Chelsea, are the lead pastors of The City Church in Seattle, Washington. Judah is in high demand as a speaker, both in the United States and abroad. Judah and Chelsea have three children: Zion, Eliott, and Grace. “Judah Smith is a unique gift to my generation. In Jesus Is _____, he will motivate you to let go of your preconceived, limited view of Jesus so you can embrace who He really is in our lives—more real and relevant than we have ever imagined.” — Steven Furtick, lead pastor, Elevation Church and author of the New York Times bestseller 'Greater'. “Perhaps the most daunting and humbling task we have as Christians is to finish the sentence ‘Jesus is . . . .’ As many of us saved by His grace are aware, He is King. He is Lord. He is salvation. But to many in our world, He is most prominently . . . misunderstood. There is not another human being on earth whom I know personally, who could tackle a book subject like this as well as Judah Smith. To Judah, Jesus is everything. And from that platform he writes this book. I eagerly await its impact in my city, New York City, and beyond . . . it's overdue.” — Carl Lentz, lead pastor, Hillsong Church, New York City. “Every once in a while a book is written that does not only contain a powerful message but the author is a living embodiment of the message thus making the book all the more life changing! The book you are holding in your hands is one of those. As you read through this book you will discover that Jesus is not at all like you thought and so much more than you imagined.” — Christine Caine, founder of the 'A21 Campaign'. “This book gives any reader—regardless of where they are in their faith walk—the inspiration to redefine and reignite a new relationship with Jesus.” — Tommy Barnett, senior pastor, Phoenix First and founder of the Los Angeles Dream Center. “I am honoured that Judah considers me his Pastor. His understanding of who Christ is, of who he is in Christ, and his passion to see people know Jesus is contagious and well beyond his years. This is his life message—to discover the person of Christ and communicate the truth of who Jesus is. We may never know the fullness of the Son of Man this side of eternity and words may fail when we try to uncover who Jesus Is ______, but Judah's revelation in this book will set you on a journey of falling even more in love with the unending characteristics of the greatest man who ever lived.” — Brian Houston, senior pastor, Hillsong Church. “Who is Jesus to you? Finding the answer to this question will change your life forever. Judah Smith is on a mission to share the truth about Jesus, and if you are searching to know more, you will find it in Jesus Is _______.” — Craig Groeschel, senior pastor of LifeChurch.tv and author of 'Soul Detox: Clean Living in a Contaminated World'. “I love this book because Judah Smith nails the big question of human existence. Everything else is minor compared to deciding who Jesus is, and what that means in our lives. It's that simple.” — Miles McPherson, pastor, speaker, and author of 'God In the Mirror: Discovering Who You Were Created to Be'. “My good friend Judah Smith is the real deal, and might be the best communicator on the planet. This game-changing book will inspire, challenge, and jolt you toward the person of Jesus, reminding us that He in fact is true life. Judah’s passion for people and spreading the gospel is evident throughout his writing, and I know Jesus Is _____ will be a message and movement that will transform the lives of many, and has already changed me.” — Brad Lomenick, president of Catalyst and author of 'The Catalyst Leader'. “For so many of us, our concept of Jesus comes from culture and tradition, not what the Bible actually says. With compelling passion and creativity, Judah helps us look through the clutter of stereotypes and connects us to who Jesus really is. The truths in this book will change your life!” — Chris Hodges, senior pastor, Church of the Highlands and author of 'Fresh Air'. “If you truly grasp the concept of this book it will change your life. We all have questions about our faith. Judah has a gift of navigating through all the religious rhetoric and sheds light on who God is, in a way I've never seen before. At the end of this book I guarantee you will feel loved by your Creator.” — Jason Kennedy, E! News correspondent. “Judah Smith is one of the best communicators I have ever heard. He is authentic, passionate, humorous, and wise beyond his years. This book will inspire you and make you laugh at the same time. It will also challenge and encourage you. As always, with Judah it is all about Jesus.” — Nicky Gumbel, vicar of Holy Trinity Brompton and pioneer of 'The Alpha Course'. “The discussion of who Jesus would be began thousands of years before he was even born. Today, the discussion (and along with it, the confusion) continues. But in Jesus Is _____, my friend Judah Smith breaks down barriers and clears up confusion about the most influential personality the world has ever known. Whether you know, you think you know, or you have no concept who Jesus is, this book is a must-read!” — Ed Young, senior pastor, Fellowship Church and author of 'Outrageous', 'Contagious Joy'. “Judah Smith explains in such a clear and thoughtful manner who Jesus Christ is and what he means to our lives. In his book Jesus Is _____, Judah presents an elaborate guide to the life of Christ, his sacrifice to save mankind, and the power of His grace. The love of Christ is such a revolutionary gift at work all around us. Judah Smith clearly has a servant’s heart and an extensive understanding of Christ’s nature. Jesus is our savior, our friend, our mentor, and our purpose in all things. Jesus Christ is alive, and this book paints that reality in beautiful and striking language.” — Pastor Matthew Barnett, cofounder of 'The Dream Center'. “Judah, thru explaining who Jesus is, teaches how we as forgiven people have the supernatural strength to forgive others and live a blessed life of freedom. Why let your past failures hold you back when Jesus has already paid for them? Judah, as a positive force, teaches what he knows, loves, and believes in . . . Jesus. As he'll often say ‘I'm a Jesus guy.’ ” — Ryan Good, stylist for Justin Bieber and producer of TV show 'Punk’d'. Christians clearly need a lot of persuading about grace. ‘Jesus is -’ is another book that tells you about a God whose primary concern is to save his people, not to condemn them. A God whose delight it is to give second chance after second chance for as long as it takes for us to get it right. I say, ‘another book about grace’, and not ‘yet another book about grace’, because you can't have too many books on the subject; especially when each new book manages to uncover a new aspect of grace and a new route toward understanding and accepting the best free gift the world has ever known and (almost) accepted. Judah explores a wide range of possible descriptions that might complete the sentence ‘Jesus Is -’; all of them perfectly good, satisfactory answers. Some are answers which seasoned Christians will recognise. Some are answers you’ll have been taught, and some are answers you’ll have experienced for yourself. But none of them, insists Smith, ‘complete’ the sentence. There is only phrase that will properly do that. And only when we properly give the complete answer, can we properly discover and enjoy that new way of being human. In characteristic style, the author goes on to analyse a biblical passage that illustrates how God’s view is so often contrary to our own judgements. In this opening chapter, Judah Smith opens up the account of Jesus’ encounter with the ‘superbad’ Zacchaeus. What follows is the kind of line by line retelling that easily translates into a Sunday morning sermon or all age worship session making the ancient tale real and relevant to modern audiences. Nothing new for experienced Bible users, perhaps, but for new readers and believers, this style of exploration might well add life changing revelation and insight. In ‘Jesus Is …’ Judah Smith completes the sentence by analysing and explaining what the Bible says about Jesus’ person and purpose. Showing that the reality of who Jesus is, remains too big for the blank, he examines the reasons why Jesus is both greatly revered and harshly criticised – but mostly, misunderstood. ‘Jesus Is…’ reveals Jesus as more than a good teacher or even an inspiring leader and points the way for you to meet with him in a deeper, lasting and life enriching relationship.